Just when I thought I couldn't possibly outdo myself, I came up with a twin cookie to keep the spectacular Polenta Citrus Sable (Sand) Cookie Snaps company. The flavor combination is inspired by the Poppy Seed Lemon Chiffon Cake I posted back in 2010. While my diet growing up was predominantly Indian based, this classic cake was a part of our Israeli repertoire. Poppy seeds and anything citrus are part of Israeli culinary identity among other foods. Jaffa citrus does not need an introduction and poppy seeds are traditionally used in March, during the Jewish holiday, Purim, when making Hamantaschens. This is basically the long and the short of the inspiration for these cookies. I will elaborate more about Purim when we get closer to Springtime, 2014. For now I am happy to add another successful sable cookie to my steady but growing collection. 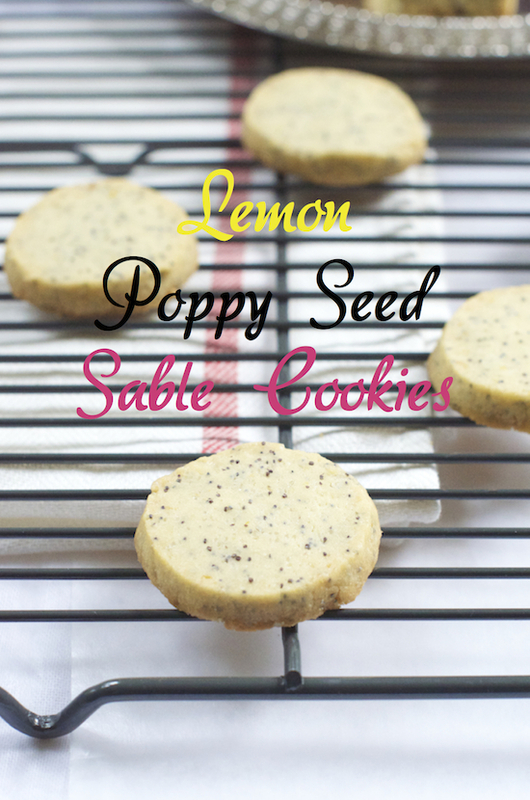 Both these Lemon Poppy Seed Sable Cookies and the Polenta Citrus Sable Cookie Snaps are no ordinary shortbread, but delicately sophisticated year-round cookies to go along with my afternoon tea. Add the butter into a Kitchen Aid mixer bowl and beat on medium speed with a paddle attachment until smooth. Turn to low speed and add the sugars, lemon zest and salt and continue beating for about a minute longer. Throughout the process, scrape the edges of the mixer bowl once in a while. Add the egg yolks and mix until blended. Add the flour and poppy seeds and keep beating on low for 30 seconds to 1 minute until the dough is barely incorporated. Use a rubber spatula to mix further if flour is not entirely incorporated. Process the dough as little as possible. On a smooth surface halve the dough and shape into a 1 1/2 inch in diameter logs. Wrap with a plastic wrap and refrigerate for 4 hours or ideally overnight. Parchment paper two cookie sheets. Preheat oven to 350F. With a sharp knife, slice the cookies, one log at a time, into less than 1/2 inch thick discs. Lay cookies on cookie sheets and bake for 17-20 minutes or until the cookie snaps slightly golden around the edges at the bottom. Let cool down to room temperature so cookies will settle. The cookies will be super soft coming out of the oven. When I make a few batches at once, I freeze the cookies in a plastic tupperware with a lid with parchment paper, repurposed from the baking process, to divide the cookie layers. Thaw on the counter for a minute or two. TY Rosa. Very few left here. If there every was a summer cookie this would be it. So true. Thanks 4 drawing my attention to the summery part of these cookies. Try a different citrus with it or altogether the polenta orange sable one. Link in the post. Who can refuse an amazing poppy sable cookie, bookmarking this one. TY Asha. Let me know when you make them. I'd never say no to a lemon cookie, these look scrumptious! I didn´t know poppy seeds and citrus were staples in Israel. Your polenta cookies are one of my favorites. These sound and look stunning Shulie!